Extreame Savings Item! Save 44% on the PHILDA Garden Clogs Water Shoes Quick Dry Mesh Sandals Breathable Mule Beach Sport Indoor Outdoor Shower Slippers for Men Women Light Blue 42 by PHILDA at Mas Fashion. Hurry! Limited time offer. Offer valid only while supplies last. Men Women Garden Clog Shoes Non-slip Lightweight Sandal Slippers Supply comfortable, fashionable, multipurpose slippers for you in the whole summer. Occasions: beach visit,vacation,pool,fishing,house cleaning,cruise,travel,swim,walking with the dog,shower,aqua therapy,water park class,etc. ♥Breathable and Quick Dry Holes Upper - Clogs style of upper guarantee a good air permeability. 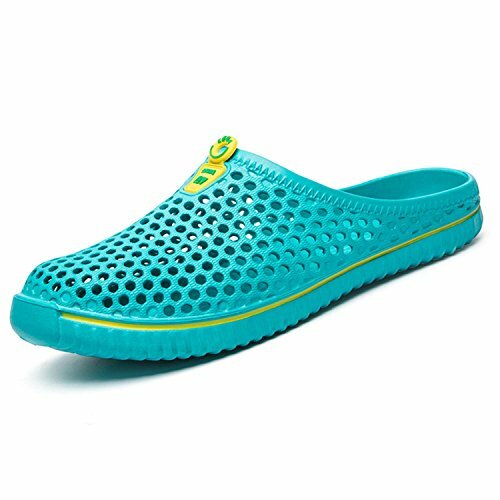 The unique breathable clog structure provides incredible air permeability and fast drying performance. The special construction of the upper allows the foot to breath freely and move more dynamically. ♥Anti-slip Outsole - Professional anti slip outsole provides excellent traction and stability for various surfaces and terrains. Anti-slip for a safty wearing anywhere, quick drying, EVA material for a great durability and higher wear resistance. Unique bump design, feel that you are enjoying the massage. ♥Extensive applications - Suitable for outdoor activities or house uses, beach entertainment, shower, pool, gym, hotels or just have a walk with dog etc. You can take this shoes to to garden or yard or nurse working,or just enjoy the sport activities like the swim or water class. ♥Multi-age can be used - you can purchase it for youself as garden shoes or house slippers,you can aslo buy the slipper for your mother as a gift or buy it to your father which can help them do garden or yard or fishing work.you can buy it for your boyfriend or girlfriend,there are many size and many stylish color you can choose. If you have any questions about this product by PHILDA, contact us by completing and submitting the form below. If you are looking for a specif part number, please include it with your message.